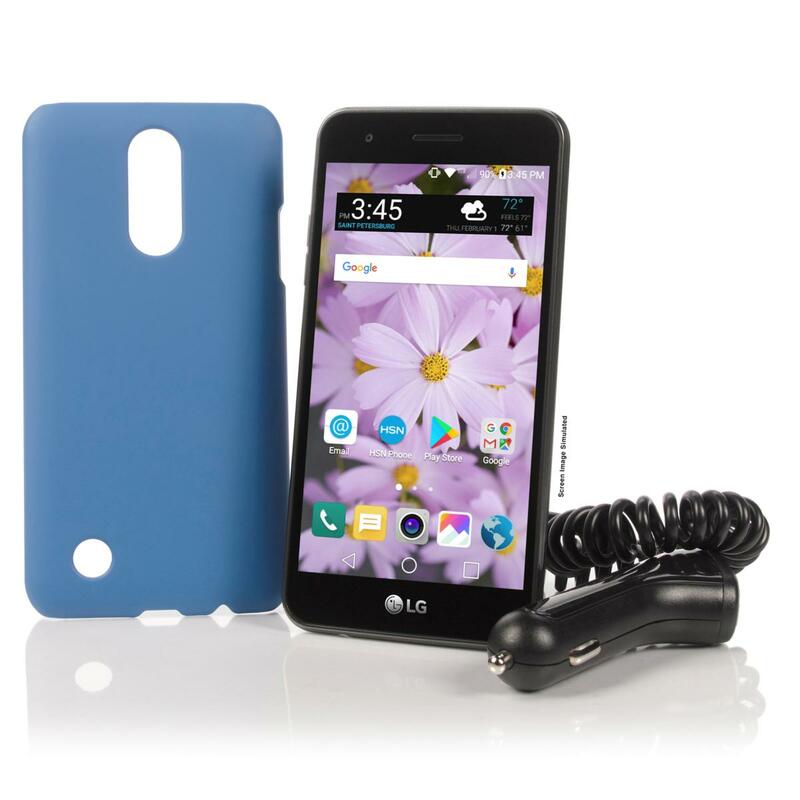 This week's Deal of the Week is the TracFone LG Rebel 3 16 GB LTE Android phone with with 1500 minutes, texts and MBs of data, one year of service, plus a generic case and car charger for $59.95 at HSN. Shipping is free. The LG Rebel 3 is TracFone's newest entry level Android phone. It uses the Verizon network and runs Android 7.0 Nougat. Specifications include a Snapdragon 210 SOC, 2 GB of RAM, 16 GB (10 GB usable) internal storage and a 5 inch 480x 854 px screen. The main camera is 5 MP and the front facing camera is also 5 MP. The 2500 mAh battery is removable. WiFi 802.11 b,g,n is supported and the memory card slot accepts cards up to 32 GB. Most of the Rebel 3's specs are decidedly low end, especially the SOC, screen resolution and camera. But the 16 GB of internal storage and 2 GB of RAM are double what's typical at the low end. The added RAM should go a long way to help the low end processor keep up with tasks. The best thing about this deal is that the included airtime is worth $125 by itself. If you are a current TracFone customer, transferring your service to the Rebel 3 will add 1500 minutes, 1500 texts, 1500 MBs and a year of service to your current balance. If you don't like the Rebel 3 you can transfer service back to your old phone or BYOP SIM and keep the added minutes, texts and days of service. TracFone Samsung Galaxy Luna (Verizon) triple-minute LTE Android phone with 1200 minutes, texts and MBs of data, one year of service, case and car charger $79.95 (reg $79.99 w/o airtime) $6.95 shipping at HSN. 4 Lines of $50 Unlimited Gigs Plan for $100 ($110 with Todo Mexico) Family plan promotion. New activations only, at least one line must be a port-in from a non-Sprint based MVNO or operator. 4 or fewer lines $100, 5 lines $125. Ends 3/8. Unlimited Data For $40 For a limited time get $55/month Unlimited 2 Plan for $40 after $10/month port in bill credit and $5 auto play discount. Free and Discounted phones for port-ins: Samsung Galaxy Amp 2, Alcatel Verso Free, LG Fortune Free, ZTE Overture 3 Free, CPO ZTE Sonata 3 99¢, CPO Alcatel Streak 99¢, CPO Alcatel Pixi Theatre 99¢, CPO Samsung Galaxy Sol 99¢, CPO HTC Desire 520 99¢, CPO HTC Desire 625 99¢, CPO LG Risio 99¢, CPO LG Spree 99¢, Alcatel PulseMix $9.99, LG Harmony $19.99, Alcatel Idol 3 $19.99, Samsung Galaxy Amp Prime 2 $29.99, ZTE Blade X $29.99, Alcatel Idol 4 with VR Goggles $39.99, LG X Charge $49.99, Samsung Galaxy Halo $69.99, HTC Desire 555 $69.99, LG Stylo 3 $79.99, ZTE Blade X Max $79.99, Alcatel Idol 5 $129.99, Samsung Galaxy S8 $349.99 when you port your number to Cricket. Verizon (or Verizon MVNO) Samsung Galaxy Note 4 N910V LTE VoLTE Android phone (manufacturer refurbished) $149.99 Free shipping. Verizon (or Verizon MVNO) Samsung Galaxy S5 G900V LTE VoLTE Android phone (new) $167.99 Free shipping. iPhone SE 32 GB free or $150 off any iPhone at MetroPCS stores when you port an number and activate on the $50 or higher plan. 10% off AT&T Prepaid, TracFone, Verizon Prepaid and T-Mobile airtime cards. Free $20 Target GiftCard when you buy any Cricket Wireless phone AND airtime card. I got an iPhone SE from MetroPCS for free port-in promotion. I paid a month of unlimited service ($50), sales taxes(about $15), and trashy accessories (approximately $20). Total I paid about $85. Not bad. The sales tax on the Iphone SE was not on the $399 list price but on the $200 store price? Do you have to stay on the $50 plan for certain timeframe or can you change to the $30 plan after one month of the $50 service? Whether sales tax is charged on the full price or the discounted price depends on your state's tax code. You should have only had to pay $50. Sales tax won't be charged for free phones at corporate MetroPCS locations. You can find them on the MetroPCS website locator. Non-corporate locations may also charge you for the SIM (though it comes with the phone already) and various other nickel and dime fees. After the phone is activated, you can downgrade to a cheaper plan. The free iPhone SE 32GB for switching to MetroPCS is by far the best deal..not sure why it's not even on the list? I just added the free MetroPCS iPhone SE deal. It's the best PHONE deal. As in, talking and texting, with some browsing and apps. The perfect size. If you want a big screen to watch your videos buy a tablet. That's much better than a compromised phablet. Unless you enjoy holding a big slab to your head or wearing ear decorations and looking like you're talking to yourself. That's your view, but most do not share it. Properly-sized 5 inch plus phones have taken over because most people think this size is "perfect" as opposed to the painfully tiny size of the iPhone SE. The only "compromise" being discussed is with tiny, cramped 4" screen phones with tiny screens and an onscreen keyboard so cramped you hit 2 or 3 keys instead of 1 every time you type a letter. And I am not alone in the opinion that phones large enough to actually use are MUCH better. And the companies know what customers need. I suppose Apple could come out with its new iPhone 11, XS etc this year all in 4 inch sizes, and watch their sales go to lower than LG's. Because no successful company is pushing phones too small to use. "Smartphone screens find their size sweet spot"
And this sweet spot is between 5" and 6"
with this trend chart showing sales of 4" phones as being very small and expected to shrink over the years. "The Iphone SE is getting an upgrade to a 4.5 inch screen...gadgetsnow.com/mobile-phones/Apple-iPhone-SE-2"
That website is wrong. The SE-2 has been out for a long time - this is the model MetropCS is giving away. And it still has a 4" screen. iPhones made in India are not sold in the USA. The tech crunch chart shows that ~350M phones were sold last year with screens at least 4 inches but smaller than 5 inches. That is not a "very small" number of phones. It's almost 1/4 of the total smartphones sold, or 30% of smartphones sold with screens 5" or larger. About 550M phones sold had screens between 5 and 5.4" and about 525M had screens 5.5" and over. Clearly 350M sales represents a whole lot of people still choosing to buy smartphones that aren't phablets. That number would be higher if more phablet buyers could also afford a tablet. That's a bit of "spin". The total raw number of 4-inch phones is still a small percentage of total phone sales. The wild speculation that those that buy nicely-sized phones would rather really have a tablet is probably less valid than the idea that so many of the 350M sales of 4" phones are old junk, out-of-date designs that will soon be replaced with 5 to 6-inch handsets. "Is "phablet" a necessary word anymore? ..."
Anonymous of 10:30PM: "best deal? for a 4 inch phone from 2015? ..." Actually the iPhone SE is from March of 2016. And the 32GB version for this deal is from last year. I plan to spend another two months of $30 service and unlock it. I'll have $130 into it, compared to that the Apple store wants $350. Current service is Teltik $23 on a Moto G4 Play. The iPhone feels like the highest quality cell phone I've ever had. Phablets aren't really phones. They are tablets that can make phone calls - you have to use two hands to use them effectively - you can't easily reach the whole screen with a thumb or finger unless you put them down flat. These are truly compromised devices. Too big for frequent use as a phone, and too small for enjoyable video. Awkward and flawed. Phablets may be popular now, but that doesn't make they 'ideal.' this will evolve. Like wide ties and bell-bottoms. The future is wearable tech, not giant phones. Five years from now phablet owners will be ashamed to carry them around, and won't admit they ever owned one. I almost always use my 5" phone one-handed. The phones are much less "compromised" then the smaller ones. Not only are the phones of the 5-6" size (formerly called "phablets") really phones, this size category is far and away the most popular. For good reason. The perfect size for a phone, without the awkward flaws of too-small 4" devices. And not only a great phone size, but large enough to watch video on also. And five years from now we are more likely to have phones over 6" dominate than the failed joke of wearable tech with those Glass-holes and Android Wear watches with 6 hour battery life. And oh yes Apple watches which are just phone accessories. The 2010's version of bell bottoms and wide ties? You are looking at it with goofy wearables, and not large-enough-to-actually-use 5-6" phones. I get it, you are too clumsy to use a modern perfectly-sized smartphone with one hand. Solution ? Use two. Problem solved. By the way, Apple is coming out with a bigger iPhone X this year. It will sell much more than the smaller one. Go Apple! Need to sign up for the Fry's email coupons. seems the Amazon Prime has lost its luster, I do not see much if any price advantage to purchasing an amazon device. Why would anyone choose Amazon device with their embedded apps over a plain unlocked version? PSA: If you're in the market for a new phone, try to wait for the new Oreo-infused Moto G6 and E5 series that are about to be unveiled. Will Metro unlock the iPhone SE? How soon / much $? MetroPCS will unlock phones after they have been on the service for 90 days. Or, search eBay for 3rd party unlocking services that support MetroPCS iPhones. Just stopped by a Metro PCS store in Seattle. They will only offer $50 discount (rather than $150) on the iPhone SE if you want to port a Google Voice number! Can iPhone se with metro be had for free on 4for100 plan? Wondering if anyone can recommend a free or inexpensive faxmail service. Efax closed my free account. Great work Dennis. You had mentioned last week that it takes you about 6 hours to put this together? I wonder if it would be more worthwhile just to do the top ten android deals and top ten iphone deals? Then you can dig to some of the issues in depth such as whether the Huawei Elate can be unlocked from Crickett cheaply and the pros and cons of the security debate about Huawei phones? I agree, only list the best high end and low end deal from each of the big four or their clients. Then, Dennis could spend some time discussing unlock deals, ways to bypass hotspot restrictions etc. Dennis, You already do this with service plans where you recommend like top 5. This past holiday, I was monitoring for a $300 new iphone 6s prepaid but one never showed up. Now it's here. Att prepaid is a decent choice and it can be unlocked through their cheap plan. Both of those are more DYOR types of topics, where as phone deals are largely tedious to find. Personally though, I think the list can be slimned down to just Verizon and unlocked deals, both to save time and get to the point. Locked GSM phones are redundant while Verizon doesn't play well with unlocked devices, and Sprint is an all around non-starter, so there's really only two options for savvier phone buyers. I would like to see a section for car phones like those linked below. Much more interesting. I'm looking for the best deal on a genuine Vertu Ascent Ferrari 60. Don’t forget the new, rugged, modular Land Rover Explore phone from British company Bullitt. They also make the CAT S61, the very best phone for the working man. It can save lives. I want to find the best deal on this one. I concur. Let the PPN readers do the research on the latest prepaid 5 megapixel Kyocera phones with 2MP selfies. With iPhone signing over icloud control to the Chinese Government, this affects everyone. PPN needs a few more "Topic" oriented articles each month to get these meat grinders cranking. Some of these Anons here are quite helpful in their insightful comments. Ah, the wonders of those who read only the headlines of clickbait and then shout fake news from the rooftops. The iCloud control in China being referred to is for Chinese, China-based customers ONLY. While this does affect hundreds of thousands of users in China, it certainly isn't "everyone", Chicken Little. It might make sense for PPN do articles on things that happen on the other side of the globe that only affect people on the other side of the globe, but let's first see if it makes sense. That is, is there a large proportion of PPN readers in mainland China? Or are there ANY? Apple giving the Chinese government access to iCloud data sets a precedent. Every nation will now expect Apple to do the same for them. Apparently this only affects those who live in China and Tibet, and probably those traveling to these two countries. No, the Apple change does not affect foreigners traveling to China. The keys don't move with the iPhone or iPad! "With iPhone signing over icloud control to the Chinese Government, ..."
Apple is not signing over control of keys to the Chinese Government. Apple and their subcontractor will only give access to an iCloud account if the Chinese government provides a lawful order for access to a particular account. According to Apple. using incompatible words like "Chinese government provides a lawful order" together in a sentence, was that for our amusement? There will be no need of a key for access to their citizens. Just cut off a finger, pluck out an eye to unlock the phone, then sell the rest of the citizens body parts for the elite's life extension & cloning labs.
" Apple and their subcontractor will only give access to an iCloud account if the Chinese government provides a lawful order for access to a particular account. " Truth be told, "lawful" in China merely means anything demanded by a bureaucrat/party functionary. Ask anyone in occupied Tibet what "lawful" means.